Map View, our market-leading property insurance perils visualisation tool, from LexisNexis Risk Solutions, has been taking the understanding of property risk to a deeper level. Map View is now able to provide risk scores based on building outlines and provide historical flood data as well as real-time flood alerts via a direct link to environment agencies. 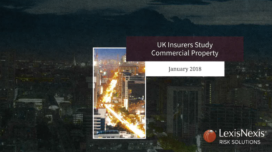 The new enhancements have come as the UK property insurance market faces upward pricing pressures this year and as insurance providers demand a greater understanding of risk. Our recent LexisNexis Risk Solutions research* found that 19% of commercial property insurers are not using any form of data and analytics to support their business, despite 86% saying they believe that data and analytics will be transformative. Furthermore, nearly eight in ten commercial insurers (78%) said that better understanding and managing the risk profile of their book was a key focus for their organisation. Risk scores based on building outlines are particularly valuable in instances where one address may cover a large area such as a factory or industrial site and will factor in the risk of fire spread between buildings. Map View has led the market in providing perils risk scores based on individual addresses. However, as risk can vary across a plot of land and can be based on the proximity of buildings to one another, we have taken Map View to the next stage of development with perils data based on the building outline. Not only is this fairer for the customer, ensuring they purchase the appropriate level of cover at the right price, but it also can improve quotability for the insurance provider. Map View has changed the understanding of risk in property insurance and these latest advances will enable insurance providers to gain a far greater understanding of the risks they underwrite. The addition of historical flood data and flood alerts will put insurance providers on the front foot when managing flood claims, helping them to support their customers and reduce their claims costs. For more insights from these research results download the LexisNexis Risk Solutions commercial property insurance white paper ‘Enabling Enrichment’. *LexisNexis Risk Solutions carried out an anonymous survey, the UK Commercial Property Insurers Study, 14 November – 13 December 2017. Data collection: A mixed mode of web and telephone survey was used to collect data. To qualify, respondents were screened to meet the following criteria: Currently employed in the insurance industry (direct insurers, indirect insurers, brokers, and MGAs) with responsibilities related to underwriting or pricing. The sample was 77 commercial property insurers who spend most of their time working in the commercial insurance sector.